Find our list of favorite christian Christmas songs and carols. Here, we collected and compiled some of the best and all-time favorite religious and christian Christmas songs for church, chorales and hymns. 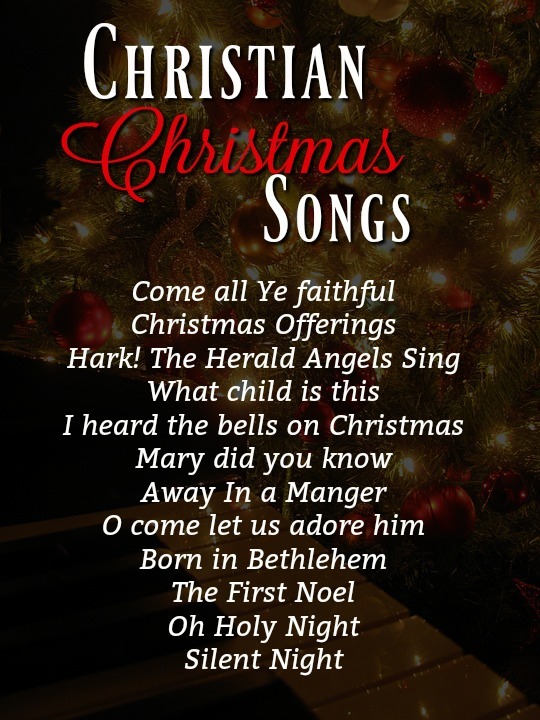 We also include some contemporary Christmas songs and christmas worship songs. Hope you enjoy them. We’ve always honored Christmas by singing Christmas songs and hymns, which reminds us of this perfect miracle of love. There’s no hiding the excitement and longing felt when Christmas comes around! It’s the one season we wait for all year. Family, friends, gifts and bright lights are only but a few things that makes Christmas so special. Amidst all these, do we stop to think about the true meaning of Christmas? It’s the celebration of the birth of Christ our Savior, who had the choice to come in all glory, but chose the humble form of an infant. Born in a manger, wrapped in swaddling clothes, devoid of luxury or wealth, with hay as his bed and animals for companions. There are so many christian christmas songs and carols to mention but to me, these are the best ones. We hope that you enjoy this list. 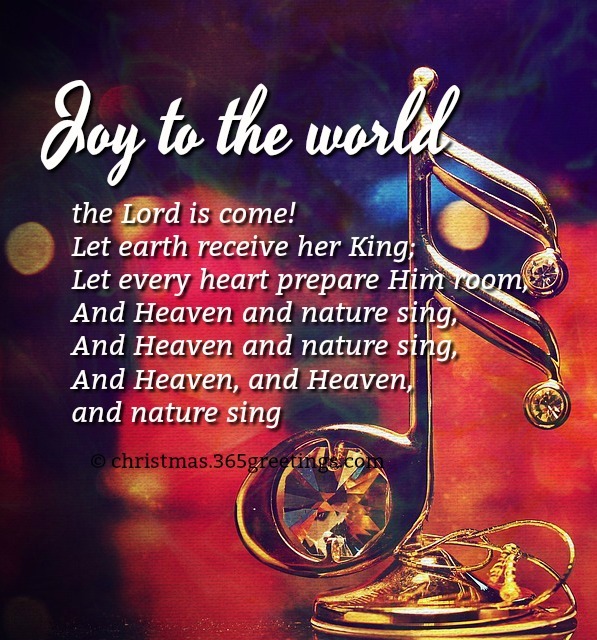 We also have a list of Christmas carols with lyrics that you might enjoy. This has a fresh and modern take on this one of the most popular Christian Christmas songs, prompting our hearts to sing “O come let us adore him!” He is the king of heaven and of earth. This original Christian christmas song by casting crowns, touches our hearts by reminding us of the honor and gratitude we owe to Christ, by giving ourselves as offerings to Him, being the first to offer Himself to us. Composed over two centuries ago, this hymn can be said to be one of the christian Christmas songs. There’s a reason why its endearing words will always warm our hearts, and be a part of our Christmas. The angels acknowledging the baby king must have been a sight worth remembering. A christmas song whose soulful words fill our hearts with a deep appreciation of the truth that, while we celebrate Christmas, we are reminded also, it was only the beginning of a child, who from birth was born to die for all. There’s nothing on earth we wish more than peace and this beautiful prayer to the world, by casting crowns truly captures the heart. This is one of the most wonderful Christmas worship songs to include in your playlist. This Christmas christian song is an alluring masterpiece loved by many, with a unique perspective of the honor and responsibility carried so gracefully by the one chosen to birth the world’s savior. For those who truly appreciate the beauty of acapella, will consider this a fine execution of this christian christmas carol. Hillsong brings an unconventional spin on the beloved carol, along with a brilliant application of drums and instruments without losing its original substance. This Christmas worship song piece by third day, brings to Christmas a more upbeat touch to the Christmas spirit. This timeless Christmas carol, relays the events surrounding our savior’s birth in verses that will forever be a part of Christmas. Another remake of a heartwarming classic, Sam Smith’s version garner’s a powerful emotion, which makes it feel like a Christmas love song for a loved one. Yet another christian Christmas song, there’s no denying its inherence to Christmas and why we hold this song so dear. This version gives a more classical rendition of this Christmas favorite. This Christian christmas song tells a moving and beautiful story of a son’s love for his mother and how much a small gesture can come a long way in changing a life. Here’s one of the best religious Christmas songs for this holiday. Another unique perspective on how Joseph must have felt. A father wanting so much to protect the child on whose little shoulder rests the salvation of the world. A reminder to the world, of the king rejected by his home town and still being rejected by the world today. This especial duet, sang with Audrey Assad, renders the heart a quiet reminisce of Christ’s humility. Christ was the gift of hope given to the world and this in itself, is a reason to rejoice! Christmas songs don’t always have to be one of the old classics and this contemporary piece by Lauren Daigle is a perfect example. Chris Tomlin is one of the renowned artists of Christian music and this epic song dedicated to Christmas is one of the reasons is songs touch many hearts. Glory to God indeed!. This unique remake of the old Christmas classic “white Christmas” although not with the Christian message, depicts how much love we yearn to receive and share, which is part of the Christmas magic. Whitney may be gone; but her iconic voice has gifted us many legendary and unforgettable songs and this Christmas special is no exception. A throw back from the 60’s, Nat King Cole will bring to some a feeling of nostalgia and to those of the newer generations a lesson or two on Christmas in vocal jazz. This, from Annie Lennox’s 2010 album “A Christmas cornucopia” does perfect justice in presenting a noteworthy execution of the British folk Christmas carol. Nora Jones’ breathy and husky signature voice, coupled with her brilliant style of jazz and soul, offers an unexpected spin of this Christmas special that will leave you spell bound. This surely brings to life childhood memories of Christmas and Harry Belafonte guide us wonderfully through that journey. The violin that leads this song’s solo along with the complementing instruments, provides an appealing melody that captures the heart in ways words couldn’t. There is truly no shortage of ageless carols we hold dear to our hearts, and Joy to the world is one of such, telling us again of the joy that is Christmas. The perfect nightwhen Christ was born, cradled in the arms of his mother, sleeping softly as the whole world acknowledges its king. Bearing the same name as the album; it’s no surprise that this Christian rock composition by Mathew west garnered critical acclaim, in the year of its release. Its words encourages us to remember what matters most at Christmas-love. Who knew, this simple hymn written by a Unitarian pastor, as a request from a friend, in a small town in Massachusetts, would become one of the world’s beloved carols. There’s no telling how the different versions of this work of art, from the unique vocals of Pentatonix to the much simpler versions staying true to its original. Sometimes we just have to go back to the roots, to really appreciate its evolution. Everything about this contemporary piece from Heath’s popular album “Christmas is here” does not only lift the Christmas spirit but also presents a different style to Christmas songs without losing its true message. This ageless Opus originally composed by Schubert, may be song in words we barely understand, but listening to Archuleta’s stentorian command of his vocals may very well transport you to a Christmas themed opera. There are various versions of this Christmas sensation, Tevin’s just like many others will make us realize why we could never tire of it. It’s truly one of a kind. We may have seen this on this list earlier, but there’s a reason for this, David’s Christian rock take on Joy to the world, with its drums and youthful appeal, is one word-Phenomenal. Another christian rock and bluegrass style of Christmas song by David Crowder, this song will surely sit well for the younger generations, who may find the classics a bit on the boring side. Need I say more? It’s David Crowder! This surprisingly is a much mellow version of this children’s favorite, bringing a more sophisticated feel in soft rock. The third duet on here, featuring Faith Hill. This song reels you in from the beginning and keeps you awestruck until its unexpected end. I’ll bet you’ll keep hitting repeat. Exceptional is only one way to describe this fine piece. Moving farther from more traditional to the more unconventional, this is a Christmas song for today. Big Daddy weave depicts passionately the beauty of the birth of Christ. This world famous worship band has, without any doubt brought us countless exceptional songs. This song, compelling us to hold unto Christ the Son of God and king of glory, is just as exceptional. A very fine number by Baloche, imploring all to adore Emmanuel our hope. Originally composed by James Montgomery, Steven Curtis’s may be a tard faster but not in a bad way, it brings a fun tone to the classic. It’s definitely lovely to see Chris’s version of a Christmas song and expected it surely doesn’t disappoint. A Christmas song for that special person. 47. Ding Dong Merrily On High – The Chieftains and the renaissance singers. Want to hear a quintessential Irish rendition of Ding Dong Merrily on High? Complete with bagpipes or more accurately Uilleann pipes, tin whistle, flutes, bodhran and perfect vocals! This would make you imagine Christmas in a fairyland. It’s definitely like nothing you’ve ever heard. A gold certified singer with 44 albums to his name, definitely a gem of his time. Pure, sonorous and astonishing are only but a few words to describe William’s exhibition of a powerful command of his vocal prowess in singing this epic solo. Somethings are never too old, they are simply perpetual. The final traditional carol on this list, not saving the best for last, because somethings are just collectively invaluable. God rest ye gentlemen is a joyous hymn that reminds us as many just like it, of the good tidings of this wonderful season. One of the oldest of carols, dated back to the 16th century, it’s no wonder it has lasted this long and also why we know it will never fade out. Wrapping this up with Chris Tomlin’s light of the world, telling us that Jesus was God made flesh, who came to a world of darkness to give it His light. He is the light of the world, the reason for the season, the hope we cling to, the source of our joy, Love’s incarnate and the reason for Christmas!!! I hope this list of Christian christmas songs and christian christmas hymns, makes your Christmas celebration as perfect as it could be. If you would like to suggest some christian christmas songs 2017, feel free to comment below. There’s nothing I can say but to wish you a very merry Christmas.